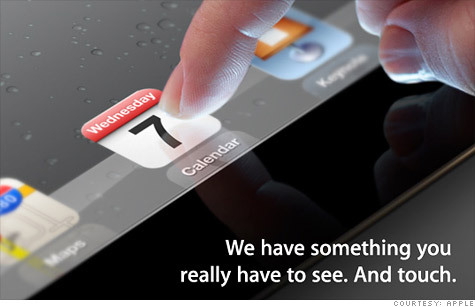 Apple is expected to announce the iPad 3 at a “special event” in California next week. Apple sent emails to journalists on Tuesday, inviting them to the private event in San Francisco on March 7, at 10 a.m. Pacific Time. The company did not immediately return a request for comment on whether it will indeed be the iPad 3. Apple shares, which had already been trading higher before the announcement, ended the day up 1.8% and hit another all-time high. The company is getting close to a market value of $500 billion. If the March 7 event does bring the third iteration of Apple’s (AAPL, Fortune 500) popular tablet, it will come nearly one year after the announcement of the iPad 2. It’s unclear what changes the iPad 3 will bring — though rumors abound, as they always do with a new Apple device. There is speculation that the iPad 3 may come with a stronger, bigger battery — making the new tablet thicker than the previous version. Another oft-cited rumor is retina display: a high-pixel-count screen that’s already available on the iPhone 4S. Other reports claim the iPad will come with a faster processor, a better camera, the Siri voice assistant and the ability to run on 4G cell networks. There is also chatter that the iPad 3 could be about $60 more expensive than its predecessors. Both the original iPad and the iPad 2 started at $499 for Wi-Fi-only and $629 for 3G. After the iPad 3 is released, those older models will likely get a price cut: When Apple announced the iPad 2, it began selling the original iPad for $399. The last time Apple updated its tablet, the company focused on both hardware and performance. The iPad 2 is 33% thinner than the original tablet, and twice as fast. The iPad has largely dominated the tablet market, as sales of other devices — including the Research in Motion (RIMM) BlackBerry Playbook, the Samsung Galaxy Tab and Motorola Mobility’s (MMI) Xoom — have disappointed. By comparison, Apple sold a record 15.4 million iPads in its latest quarter — more than double the amount sold over the same quarter in 2011. Those strong tablet sales helped push Apple to record quarterly revenue of $46.3 billion and record profit of $13.1 billion.